Manchester United must be sick of the sight of Hull City after playing them three times since Christmas. Despite a slow start to the season, United seemed to be picking up some momentum with their unbeaten record of 17 games coming to an end in the return leg of the League Cup semi-final last week – still not enough to overturn the aggregate scoreline. Nevertheless, a very weak Hull squad have proven themselves to be tricky opponents for United and the appointment of Marco Silva as manager has given them a recent bump. With ground to make up on their rivals, there were easier games to be had even though the table may suggest otherwise. Both teams lined up in 4-3-3 formations but their gameplans were understandably different given their contrasting ambitions. United had all of the ball with Hull sitting back and defending their point. Silva had his his men sticking close to their opposite number – Oumar Niasse would try to block passes into Michael Carrick, Sam Clucas and Evandro Goebel would follow Ander Herrera and Paul Pogba respectively while the wingers tracked United’s full-backs. 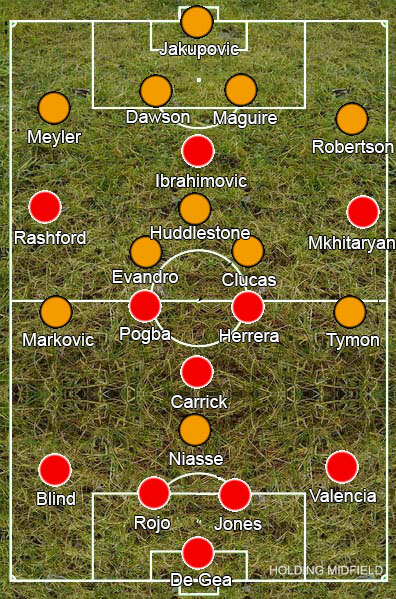 This strategy meant that United’s midfielders were unable to turn on the ball as they always had someone right on top of them, but it also meant Hull’s players were easy to drag around. Herrera and Pogba would pull out into wide areas deep in the midfield, pulling their markers away from the centre of midfield and opening up space between the lines for the attacking trio to drop into, while the full-backs would drive beyond them. This caused some issues early on as Hull’s backline struggled to adapt when United stretched them but Zlatan Ibrahmiovic’s lack of pace meant they had no real goal threat to take advantage of this lack of compactness quick enough. As the half wore on, United’s passing slowed down, allowing their players more time to join the attack up the pitch but also making it easy for Hull to adjust accordingly. It’s probably revealing that United’s best chance of the half fell to Pogba in one of the few times he managed to run beyond Ibrahimovic – the Swede flicking a pass from Carrick behind Hull’s defence into the path of United’s record signing. Outside of this, United’s biggest threat came with balls hit in behind for Marcus Rashford. With Hull’s backline stood a few metres higher than it should have been most of the time, his pace meant Eldin Jakupovic had to come racing off his line more than once and he never looked comfortable sweeping. Meanwhile Hull offered no attacking threat. The ball went up to Niasse and if he was fortunate enough to bring it down there would be several United players on hand to take it straight back off him. It probably would have made more sense to hit balls into the channels for him to chase rather than trying to find him in central positions in the air: even if it only went out for a throw-in that still gives Hull the opportunity to break up the game and move their team up the pitch, however possibly from a defensive perspective, they wouldn’t want Niasse moving too far from Carrick or even their team getting too far up the pitch. With United lacking a goal threat, Jose Mourinho understandably turned to United’s all time leading scorer Wayne Rooney, bringing off Carrick. This change saw United switch from a 4-3-3 to a 4-2-3-1, with Herrera and Pogba moving back to the base of midfield to make space for Rooney ahead of them. The improvement in Pogba’s form has coincided with the move away from 4-2-3-1 to 4-3-3 – in the attacking midfield role he has to play with his back to goal and playing in the double pivot inhibits his attacking instincts, whereas playing to the left in that trio keeps play in front of him while ensuring he’s able to join the attack when needed. The second half continued the trend, with both his and Herrera’s already lacking influence on the game dropping off a cliff. It didn’t even have the intended benefit, as United lost all creative control in the centre of the pitch. Rooney’s introduction in the middle limited the available pockets of space United’s wingers had been tucking into in the first half, while also gaining the greater attention of Tom Huddlestone, who now stayed a little deeper than he had been originally. Ignoring that he probably doesn’t even have the close control these days to play the number ten role, Rooney’s introduction had the knock-on effect of making Hull more compact in the middle and limiting the movement of Henrikh Mkhitaryan, Rashford, Pogba and Herrera. Hull’s backline also seemed to drop off a couple of yards, making it harder to hit those semi-successful balls behind for Rashford. Unable to play through the centre, United looked to the flanks. Rooney pushed up next to Ibrahimovic and tried to get on the end of crosses, snatching at a couple of half-chances but still failing to carve out many meaningful attacks. Silva added new signing Andrea Ranocchia to his defence to make a back five, shoring up what was an already comfortable defence to see out the game. On another day, Hull wilt early on or Niasse gets sent off and they get crushed, but while United were by far the better team it may be concerning how few good quality chances they created when they had so much control on the game. That Mourinho’s changes only worsened matters is unlikely to help in an atmosphere already feeling a little toxic – his constant whining sounding less like mind-games and more like genuine bitterness. With only Chelsea looking truly strong, United are still in a decent position to make the Champions League next season, however their current position can’t be seen as harsh based on their performances relative to those above them.